Atari Introduces Gran Trak 10. It is the first arcade game to use solid state read-only memory (ROM) to store sprites for each car, the game timer, the race track, and the score. 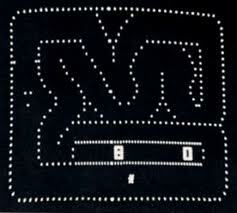 As such, it’s the the first game to have defined characters rather than mathematically manipulated dots. The game’s controls, which include a four-position gear shifter, a steering wheel, and two foot pedals, are also all firsts for arcade games.